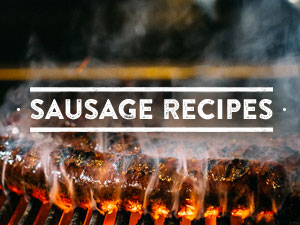 This delicious Butcher and the Boar® Smoked Cheddarwurst recipe is great for any occassion. Try slicing the Cheddarwurst in half the long way, a lettuce, tomato and serve in a bun burger style. Wash the potatoes and pat to dry. Cut the potatoes lengthwise into 8 – 10 pieces. Toss with the oil, salt and pepper. Rub the sheet tray with oil, line up the fries and bake in the oven until crisp and golden on the bottom side. Do not flip them while they are cooking or they may stick. The object is to have crispy hot fries. Sauté the onion and garlic in the butter for 5 minutes or until softened. Add the curry powder and cook for 30 seconds to toast the spices. Add the ketchup, water, lemon juice and optional hot sauce. Simmer for 5 minutes. Tip: Ketchup be made up to a week in advance. Keep refrigerated. When the steak fries are about ten minutes from completion (starting to brown) heat up your sausage. Grill, sauté in butter or put in the oven alongside the steak fries. Serve in a big pile and eat with your hands dipping into the ketchup frequently and copiously.